As I was examining my life in preparation for turning to God with all my heart, I came across a quote that stopped me in my tracks. Pastor and author Tim Keller wrote these words. Whatever you live for actually owns you. You do not really control yourself. Whatever you live for and love the most controls you. As I reflected on these three short sentences, I realized that every person is controlled by something or someone. No one is in control of his/her life. In a world that is consumed with setting goals and making plans, it is easy to think that one has everything under control and can accomplish anything through good planing, hard work and perseverance. That person says in his/her mind, I am in control! Keller brings us back to reality by stating that everyone is controlled by whatever or whoever he/she loves most. That is because what I love most I end up living for. As I was thinking about this, I came across an article about a basketball coach that I greatly admire. This coach just led his team to win the NCAA Men’s Basketball National Championship. If you follow college basketball, you know that this coach is Tony Bennet, head coach of the University of Virginia men’s basketball team. Every person is controlled by something or someone. No one is in control of his/her life. Throughout the tournament Bennett’s team was under scrutiny because last year ended in such a terrible way. 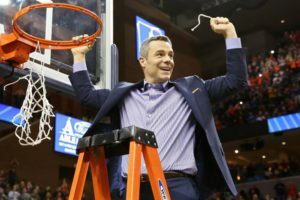 Last year, the UVa team was a number one seed and lost its first game in the tournament to a number 16 seed. In fact, it was the first time that a number 16 seed beat a number 1 seed. They didn’t simply lose the game but they lost the game by a 20 point margin. How would they respond this year as, once again, the team had a number 1 seed? Because of this scenario, Coach Bennett was repeatedly asked how the team was going to perform? What pressure did he and the team face? How did he and the team cope with such pressure? If my life is just about winning championships, if it is just about being the best, then I am running the wrong race. In one article, Bennett made a powerful statement that took the pressure off him and his team and guided them on an unbelievable path to the national championship. If my life is just about winning championships—if it’s just about being the best—then I’m running the wrong race. That’s empty. But if it’s about trying to be excellent and do things the right way, to honor the university that’s hired you, the athletic director you work for and the young men you’re coaching—always in the process trying to bring glory to God—then that’s the right thing. Bennett was saying that winning basketball games is not what controls his life. He understood that coaching basketball was simply God’s gift and that he needs to do it as a good steward that will bring glory to his Lord. Bennett’s own words proves this point. I have great things in my life—my love for my wife, my love for my family, my love for coaching, my love for basketball. Those are wonderful things, but when you line them up in comparison to Christ and the relationship you have with Him, with what He’s done for you and with what He’s given you, they don’t compare. That’s the greatest truth I know. I have great things in my life but when you line them up in comparison to Christ and the relationship you have with Him, with what He has done for you and with what He has given you, they do not compare. After reading this, I asked myself what do I love and live for the most? Is it being a husband, father or grandfather? Is it directing Kingdom Education Ministries? All of these things are very good things but do I love and live for them more than I love and live for God? Over my years in education I have seen administrators that seemed to live for the schools they led. I have seen teachers who lived for the subjects they teach and coaches and sponsors who lived for the sport or activity they led. It is easy to have these things control us. I have learned that I can identify what I am loving the most and living for by seeing what I promote the most. The Psalmist explains that what we praise or promote is what we love the most. As we prepare to celebrate the resurrection of our Lord and Savior next Sunday, take time this week to ask yourself some questions. What do I talk about (promote/praise) the most? What works do I tell others about whenever I have the chance? What am I living for — my family, my ministry, etc.? What really controls my life and my ministry? Dr. Schultz, thank you for the reminder of the importance to keep Christ as first in our lives. As I was pondering the four questions this morning, I was reminded that some really good things can get in the way of my relationship with Christ. As we enter into the Easter week, I hope that we can all keep our hope in Christ alone and rejoice in the power of His name, Jesus. Thank you for your faithfulness to Kingdom Education and the cause of Christ. I agree. It isn’t just bad things that hinder our relationship with Christ. It can be good things also. It is something that we all need to think about each day.